Author Talk And Reading – Paul Mitchell Author Of We. Are. Family. 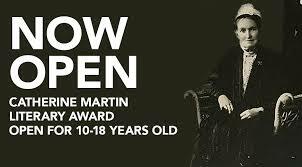 The Catherine Martin Literary Award is a competition open to budding young authors. This award is motivated by Australian Literature, and Australian themed writing, it is with this intent that participants were asked that their work be inspired by 'Australia', 'Australians' and 'Australian Life'. Local Judge Marg Muller and visiting authors Cass Moriarty & Pip Williams will oversee the judging of this award which is fast gaining a lot of interest. There will be monetary prizes for the winners and runners-up in the following categories: 10-12yo. 13-15yo. 16-18yo. Entries will be on display at the Penola Community Library. Please join the judges for the announcement of the award on Saturday 19th May at 3.00pm. Catherine Edith Macauley Martin (1848–1937) was an Australian novelist who published her work anonymously or under pseudonyms such as M. C., Mrs Alick MacLeod and Ishbel. Catherine migrated with her family to South Australia in 1855, settling in Robe and later in Naracoorte. In the course of her education she acquired a love of German language and literature and by the early 1870s she was helping her sister Mary to run a school at Elm Cottage, Crouch Street, Mount Gambier.